L-alanine increases strengthL-alanine is a popular supplement for bodybuilders and other athletes who train for strength increases. L-alanine is important in the process of energy production. Alanine may help to protect muscle from intensive aerobic exercise. L-Methionine to boost athletic performance Methionine is an essential amino acid that helps the body process and burn fat. The body needs plenty of methionine to produce two other amino acids, cysteine and taurine, which help the body to build strong muscles. Methionine is needed to make creatine that provides the energy our muscles need to move, and has been found to boost athletic performance during short and intensive workouts. L-carnitine encourages the burning of fat L-carnitine is essential in fat burning and it is also involved in supplying energy to muscles. Therefore, it may contribute towards fat reduction. Additionally, L-carnitine increases the development of muscle mass and promotes a positive state of mind. Furthermore, it can reduce fatigue in older people, and lead to increased vitality and energy. Tryptophan powder - MAXAMINO PLUS 1200 - development of muscle mass (6 Bottles): Our natural supplement contains essential amino acids necessary in the human diet that the body cannot produce own its own. However, our dietary supplements, may make it easy to get enough amino acids in your diet, including all of the essential ones most people are concerned with. BENEFICIAL FOR MUSCLES FORMATION: Leucine is one of the most important amino acid. Leucine increases the muscle as formation faster than any other amino acids. BENEFICIAL FOR BODYBUILDING: Bodybuilders often use L-Valine in conjunction with L-Isoleucine and L-Leucine to promote the muscles development. It also increases energy and supports the tissues from physical activity. L-Valine is needed for your muscle mass and may act as a source of energy in your muscles. L-Leucine may improve endurance and energy, promotes muscle tissue health and muscle support. BENEFICIAL FOR SEXUAL HEALTH: L-arginine is essential component for men's sexual health. L-arginine's properties may increase blood flow, thereby improving sexual response. L-arginine shows it sexual benefits when it is combined with other products, including the amino acid and the herbal compound yohimbe. 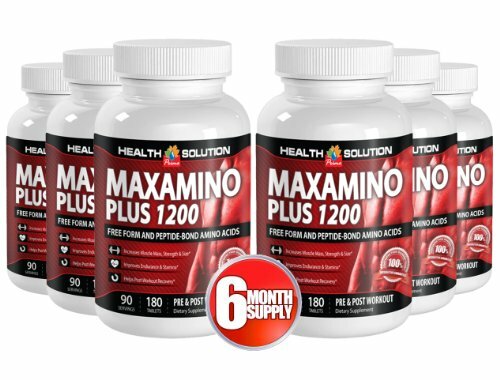 MAXAMINO PLUS 1200 - Each bottle - 180 tablets - all natural Non-GMO, Gluten-Free formula to increase physical stamina and improve exercise capacity, increase male fertility, produce energy and boost testosterone levels. Made in USA. Scientificaly standartized to the highest level of our active principles. 30-day 100% money-back guaranteed.